It’s May, so it seems inevitable that this month’s column should be a bit of a reflection on NAB. And it will, in due course. But first, some news which I think is interesting. Cisco, the IT giant, is selling off its video software solutions business. It is being bought by an as-yet unnamed new company, backed by venture capitalist Permira Funds. This division was built on an acquisition announced in March 2012, when Cisco bought NDS. If you were around six years ago you will probably remember NDS. Its charismatic chairman Abe Peled was a regular and respected voice at industry gatherings. Well what do you know: the new owners of the business have appointed as chairâ€¦ Dr Abe Peled. He has been acting as adviser to Permira Funds. Back then, NDS was valued at around $5 billion. No figure has been put on the 2018 spin-off sale, but I think we can be certain that it will be a lot less than that. A common rumour has the price tag at $1 billion, others less than that. Cisco, incidentally, has form for this sort of deal. It bought the Scientific-Atlanta business in consumer hardware and set-top boxes for $6.9 billion, only to subsequently sell it to Technicolor for $560 million. What does this new deal mean for the industry? Paolo Pescatore of research body CCS Insight said “There are too many solution providers chasing too few dollars. Bottom line, many of these solutions providers have diversified and now need to focus on core areas. Looking back to last month’s shenanigans in the desert, many â€“ me included â€“ had predicted more news of mergers and acquisitions. In fact it was relatively quiet on that front. We knew of Grass Valley’s acquisition of SAM nÃ©e Snell and Quantel. The company had done a heroic job of bringing everything under one brand, even if the former SAM booth had to become a very large lounge. Other than that, the only major business announcement was that Imagine Communications is to be split into two. The unit that handles advertising management â€“ and which looks set for a strong future as companies finally tackle the challenge of bringing broadcast and online advertising campaigns together â€“ will be run by the entirely admirable Sarah Foss. The rest of the business â€“ what we think of as the traditional product line â€“ is to be run by Steve Reynolds. While it was not clear at the time, I have since established that the two are to be run as largely autonomous business units under the Imagine banner. But it is not difficult to imagine (sorry) that the two units will become independent, and acquisition targets, in the future. The question is who will buy them. The IT giants could be forgiven for getting cold feet: they still do not seem to have any sure navigational skills through the media jungle. Only Amazon’s acquisition of Elemental seems to have succeeded by dint of impeccable logic. Back at NAB, while many of the big IT names were there, they were in general keeping a fairly low profile, often promoting the works of partners. Which was a shame, frankly, because a couple of the hot topics were around technology issues. I was on a bit of a mission to find the state of the art in cyber security for our business. It was not easy. There was a fair bit of shifting in seats and changing of subjects whenever I asked the question. I was not alone in finding some frustration. Andy Wilson of DPP told me that trusted partnerships were critical, and that includes the technology platforms that broadcast and media companies choose. “Vendors have to demonstrate their commitment to protecting broadcasters’ security,” he told me. Increasingly, media companies recognise that content needs to be protected in transit, at rest (while stored on a server, wherever that server is and whoever owns it) and at work â€“ while being processed. Indeed, a new company to me, Fortium, was showing an encryption platform which includes a full audit trail so you know at all times who has touched something and what they have done to it. “There are different levels of security: around access, around transmission and around the integrity of the data,” Francisco Ontoso-Ramos, CTO of Object Matrix told me. His technology provides encryption at rest using secure keys, so you can store media on non-trusted servers. This could save cost, which would allow you to store multiple copies of the data in different locations, making the content store self-healing. 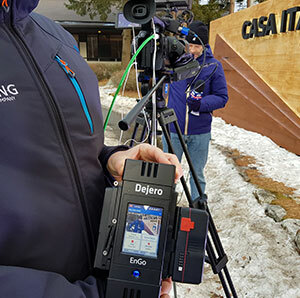 A new technique which is potentially at great risk of cyber attack is remote production: carrying all the cameras and microphones back from a remote location to a control suite at the broadcaster’s headquarters. One of the most developed remote production networks was implemented by Telstra for NEP in Australia, linking all the major soccer, rugby and Aussie Rules stadiums in the country to production centres in Sydney and Melbourne. The links use technology from Aperi. I asked company chair Eugene Keane how they could possibly secure such a network. He pointed to the discrete, FPGA-powered hardware they use, and described how you can configure it to have trusted and untrusted sides on the same board. The other IT buzzword that broke into the media big league at NAB this year was artificial intelligence. Even though most people were not talking about artificial intelligence, or at least a not very intelligent version. AWS Elemental is adding machine learning to its cloud encoding for the royal wedding. Sky will use it to scan pictures of guests arriving at the chapel, identify them, then link to more information. Viewers of the online and mobile services will be able to click on a guest to “enrich the live video content with facts about the attendees”. Tedial has developed a neat system with a European broadcaster which takes machine learning one stage further. It analyses a football match in real time and automatically creates clips, which can be offered to the director and posted to social media. The clever bit is that it also analyses the response on social media. If a clip goes viral, then the machine learns to make more like that. Lots of down-votes and it knows that idea bombed. I also talked to Qligent which has recently run a big data project with a major telco in the States, aiming to find the silent sufferers, those who are not grumpy enough about service failures to complain, but could be grumpy enough to change suppliers at the next contract. The project analysed several terabytes of data a day, drawn from Qligent’s data measurement probes, to see where there might have been less than perfect online delivery. The operator can then proactively contact the subscribers to say “we’re aware there might have been some technical issues, and we are working to see it does not happen again”. Andy Quested of the BBC told me that he sees this sort of application as the real benefit of artificial intelligence. He feels that it is the route to a real measurement of quality of experience. I certainly hope so. Finally, and talking of quality of experience, there was no doubt that this was a very quiet NAB indeed. There is still no announcement on the NAB press site, but the official figures for registration â€“ they go through a statistical validation to get to an estimate of attendees â€“ had a 10% drop this year over 2017. One detail not immediately obvious from the raw numbers is that the number of exhibitors rose from 1518 last year to 1718 this year, or about 13 % more. Given that those 200 exhibitors are likely to be small this might be only around 1000 people, but that makes the drop in visitor numbers that much greater. Does this mean the industry is falling out of love with exhibitions? Or does it mean that the industry is in a period of consolidation while we work through the challenges of moving to IP connectivity and software-defined architectures? Maybe we will know more at IBC in the autumn.